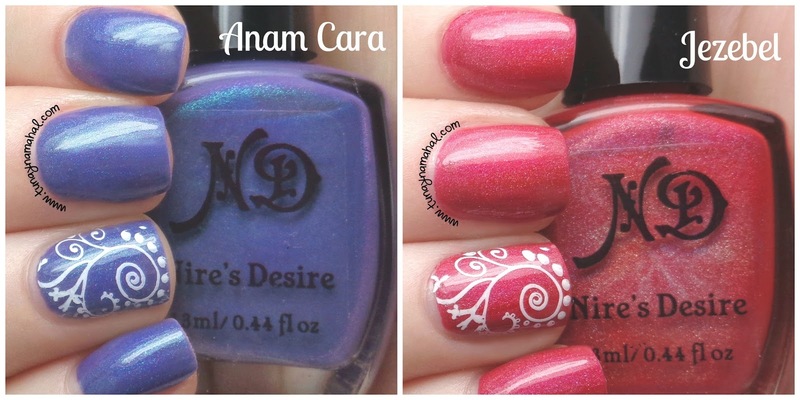 Nires Desire: Jezebel & Anam Cara. I actually picked up these polishes quite a few months ago. Bad me... they were in my untrieds pile. Nire's Desire, Jezebel and Anam Cara. Anam Cara, is a bright purple (sometimes blurple), with green shimmer. Opaque in two coats. Really nice smooth formula. Accent nail is stamped with Konad White, and Born Pretty Store stamp plate: QA76. Seche Vite topcoat. Jezebel is a deep reddish pink, holographic polish. This is pretty much a one coater formula, though you can do two coats if you want. Applies very smoothly. Accent nail is stamped with Konad White, and Born Pretty Store stamp plate: QA76. I used Seche Vite topcoat.